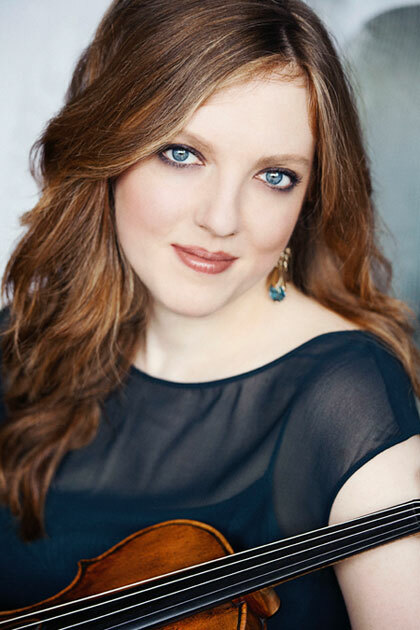 Violinist Rachel Barton Pine brings her dazzling technique and joyous tone to classical and contemporary music Saturday, Feb. 6 in the second concert of Lawrence University’s four-part 2015-16 Artist Series. The performance, which includes pianist Matthew Hagle, begins at 8 p.m. in the Lawrence Memorial Chapel. Tickets, at $25-30 for adults, $20-25 for seniors and $18-20 for students, are available through the Lawrence Box Office, 920-832-6749. Praised for her ability to connect with others through her music as a powerful, emotional and dynamic artist, Pine’s performance range spans a wide spectrum. She has appeared as a soloist with many world-renowned ensembles, including the Chicago Symphony, the Philadelphia Orchestra and the Royal Philharmonic. She also has jammed with the likes of Slash of Guns N’ Roses and other rock and metal stars. George fondly recalled Pine’s versatility during a Chicago concert she attended. Pine has recorded more than 25 albums, featuring classical favorites, contemporary artists and neglected historical pieces. Her 2013 CD, “Violin Lullabies,” recorded with Hagle, debuted at number one on the Billboard classical chart. Last September, Cedille Records released Pine’s recording of “Vivaldi: The Complete Viola D’Amore Concertos with Ars Antigua” while Avie Records will release Pine’s performance of J.S. Bach’s “Six Sonatas and Partitas for Violin” this March. That disc was recorded in the same church in which Pine first heard the music of Bach live, and experience that helped her fall in love with the violin at age three. The product of an unstable childhood in a working-class Chicago family, Pine has been called “indomitable,” in part for her struggles after a horrific train accident which severed her left leg and severely injured her right foot. For her part, Pine has refused to let those challenges derail her musical career. In addition to performing, Pine spends her time teaching and helping talented young musicians with their expenses through the Rachel Elizabeth Barton Foundation, which she started in 2011.